Lately, I’ve been giving wooden letters as gifts to friends. If using a coupon at a craft store, you can usually score a letter about a foot tall for $2. I get a pretty card stock to match their house, and pull out the Mod Podge. 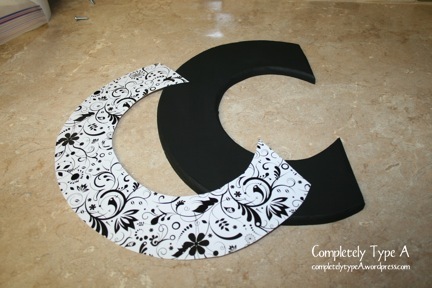 Paint your letter whatever color you want, back and front, two coats. Let dry completely. 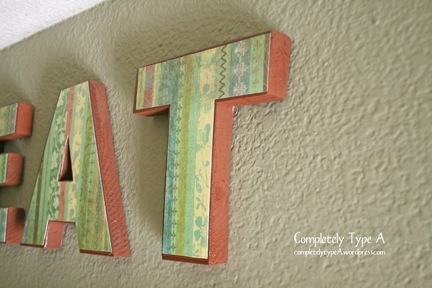 Sorry, not pictured, but do a layer of Mod Podge on top of the letter and carefully lay card stock on top. Its very important to press down completely and get out any air bubbles while the Mod Podge is still wet. I turn the letter over to dry completely pressed against my counter. You can seal the whole thing with another Mod Podge layer if you’d like. And here’s what I did for my kitchen. I had a weird, long and skinny spot above a window that needed a little something. These letters I cut out myself with a hand held jig saw. To get the shape of the letter, I just found a font I liked on the computer and printed it off, cut it out, and used it as a pattern.